Ever been in a situation that you had no control over, a life changing situation that required quick and precise action? That’s exactly the predicament the US automakers were caught in after the 1973 Oil Crisis. They were forced to deal with the hard cold fact that their bread and butter – big cars with big cubic inch motors, were losing their appeal to many Americans. There was only one solution to this dilemma, and that was a rapid shift to producing smaller more efficient cars. For the budget auto marques like Chevrolet, Ford, Dodge, etc. this was no small task but an obtainable one. However the luxury marques like Cadillac, Lincoln, and Chrysler were really left in a lurch. After all these luxury brands made a name for themselves by offering the biggest luxury land barges with every luxury option imaginable. In the past this strategy worked, and sales year after year remained robust. The hard part was the task of pleasing the traditional luxury buyer with smaller more fuel-efficient luxury cars. 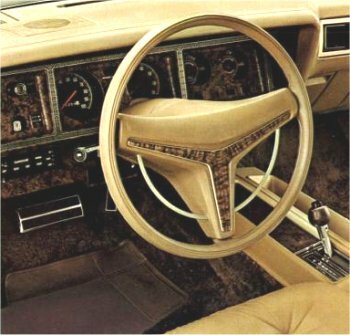 Chrysler for 1975 had its solution to this problem in the form of an entirely new car called the Cordoba. It was a stylish/sporty luxury 2-door with a whole host of features and options. Though by today’s standards the Cordoba is not a small car, however it was much smaller than other cars in Chrysler’s 1975 fleet. 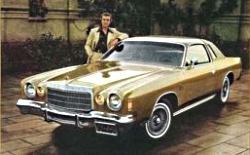 In fact in its 1975 product literature, Chrysler referred to the Cordoba as the "new small Chrysler". The Cordoba was also filling a new market niche for Chrysler, which had emerged in popularity as the muscle cars were being retired by most auto brands. This niche was the "personal luxury car". It included such cars as the Ford Thunderbird, Ford Elite, Pontiac Grand Prix, Chevrolet Monte Carlo, Lincoln Mark IV, etc. For Chrysler it was imperative that the Cordoba be a success, since Chrysler’s sales were spiraling downward rapidly as the Cordoba was making its debut. The Cordoba was a "make it or break it car" for Chrysler due to the fact Chrysler was nearing dire straights. What the Cordoba offered was luxury to a buyer who normally could not afford a luxury car. It was like flying first class for the price of a retail coach ticket. Most Americans were feeling the pinch by the mid 1970s of the downturn in the economy. By this time stagflation a combination of inflation, higher unemployment, and stagnant growth in the economy began to rear its ugly head. So Chrysler’s release of a reasonably priced personal luxury car could not have been at a better time. Putting all these factors together it was no surprise the Cordoba was a hot seller and was a mega success in a decade where the Chrysler Corporation found itself on the losing side far too often. Chrysler sold close to 150,000 Cordobas in its first year, and for its second model year sales went even higher. Also helping the Cordoba’s sales was Chrysler’s very cleaver ad campaign. Anyone who was alive during this time will remember the Chrysler Cordoba commercials which portrayed luxury and sophistication for very reasonable price. Famous actor Recardo Montebalban was the pitchman. His Spanish accent articulating the many luxuries and comforts of the new Cordoba, while the TV audience sat in awe of this unforgettable automobile. Montebalban ended the 1975 commercial by saying "with Cordoba I have what I need". Even more than 30 years after Montebalban who has starred in so many memorable movies and was even the star of a hit TV series – Fantasy Island (in the late 1970s and early 1980s) will probably be most remembered for his Chrysler Cordoba commercials. Nobody will remember James Garner’s many Mazda commercials or all the other commercials of big stars pitching different automobiles over the years. However Montebalban will always be remembered as the Chrysler Cordoba pitchman. Even young people born after the Cordoba was long gone, know Montebalban two famous words from his Cordoba commercials: "corinthian leather". The Cordoba was built on the mid-sized Chrysler B-body, which was the smallest Chrysler in its day but it would be considered big by today’s standards. The Cordoba had a length of 215.3", a width of 77.1", and a wheelbase of 115". For comparison sake the biggest car in Chrysler’s current 2008 fleet is the Chrysler 300 and it has a larger (than Cordoba) wheelbase of 120" but its length and width are only 196.8" and 74.1" respectfully. There’s no denying that a low base price of around $5,000 to buy a 1975 Cordoba, gave it strong sales however the Cordoba would never have sold in its large numbers had it not had the looks to go with its budget price. The Cordoba by 1975 standards was a handsome car. It had very elegant lines both inside and out. 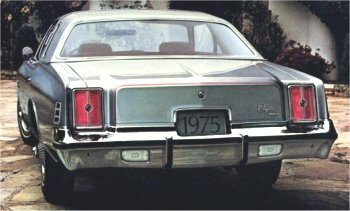 The general shape of the Cordoba was a short deck-lid and long hood design that the Pontiac Grand Prix had made famous. Of course the car still looked all Chrysler with familiar Chrysler design studio cues. The front end especially with its attractive grille was a dead giveaway this car was a Chrysler. The dual round headlight and dual round parking light design were very attractive and went well with the front grille, the design overall was very classy yet sporty. The rear design was also just as attractive with rear taillights that flowed well with its general lines. The "opera window" by the 1970s had become standard in most 2-door personal luxury cars. The Cordoba was no different, it had a nice-looking opera window behind each side window. The Cordoba may have been Chrysler’s small car but it had big block V8 power. This big block V8 was a 400 (CID) from Chrysler’s B engine family. The big block B engine first started off in 1958 as a 350 CID V8 and grew in displacement during the 1960s and early 1970s. The B engine’s most famous displacement was the 383, a very popular V8 engine among the different Mopar muscle cars. The 400 was a larger bore 383. The 400 had a 4.34 in. bore verses the 383’s 4.25 in. bore and both motors shared the same 3.38 in. stroke. The Cordoba was available in two 400 V8 flavors; one was a 190 horsepower (2bbl carbureted) 400, the other a (dual exhaust) 225 horsepower (4bbl carbureted) 400. Though the Cordoba was sporty looking, it still was a luxury car and nothing was better to move a luxury car smoothly and effortlessly than a big motor like the 400 producing loads of low-end torque. Especially when you consider that the Cordoba’s curb weight was right around 4,000 lbs. For those who wanted better fuel efficiency and decent acceleration there were two small block 360 CID V8s available: a 4 bbl (200 horsepower) and 2 bbl (180 horsepower) carbureted V8s. And since in 1975 gas was not cheap, Chrysler did offer on the Cordoba a very fuel efficient small block 318 CID V8 that produced 150 horsepower. Getting the power to pavement was Mopar’s trusty 3-speed torqueflite automatic transmission. It provided smooth shifts between gears. And it would come as no surprise that there were only grandpa style gear ratios available for the rear axle, so highway speeds were obtained at lower rpms (for better fuel efficiency) but it was at a cost of slightly slower acceleration. 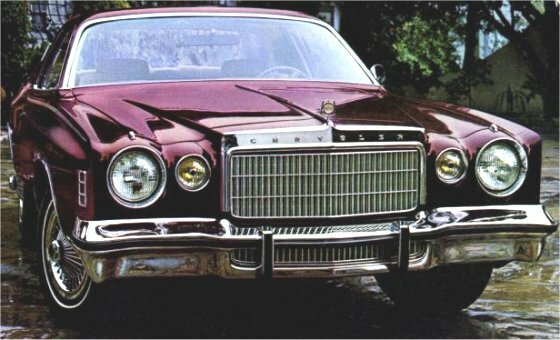 The Cordoba by today’s standards would not be considered a good handling car, however for a 1975 luxury car it was pretty responsive and its handling was better than most luxury cars of the day. What the Cordoba provided was a big luxury car ride in what was at the time a smaller car. The standard 15" wheels with GR78 x 15 white wall tires – the point where the car met the road, provided a nice comfortable ride. Where the Cordoba really shined was the plethora of options if offered. Unlike today when limited option packages rule the terrain, you could order a Cordoba with so many different personal options to make your Cordoba an almost "one of kind" car. For instance the interior provided so many different options, here alone you could make a one of a kind car. You could pick from a Split bench seat or bucket seats. 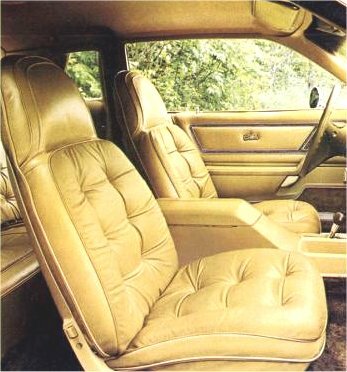 There was the standard cloth interior, upgraded velour cloth interior, or the famous corinthian leather seats. And there were plenty of power and luxury options to make a Cordoba look and feel like a mini Chrysler Imperial. The Cordoba was the perfect luxury car for the time. Most Americans were feeling the pinch economically, and the Cordoba offered a smaller luxury car with lots of amenities, a big car ride, and status for a smaller car price. Chrysler was rewarded with its efforts with fabulous sales. Unfortunately Chrysler’s success with the Cordoba was short lived, only four short years later the economic situation worsened and there was a 2nd oil crises, pushing most Americans to smaller less expensive cars. Chrysler by this time was on the ropes and on the verge of bankruptcy. The introduction of the "mini-me" Chrysler K-car 2 years later for 1981 was the only thing that saved Chrysler from death. However that would not be enough to save the Cordoba which was cancelled after the 1983 model year. Unfortunately as popular as the Cordoba was for a few years after its original release, today it’s almost forgotten. For Cordoba fans that is a good thing since a loaded mint conditioned 1975 Cordoba will be no more than a very affordable $8,000. Good conditioned Cordobas cost no more than $5,000. To those that own this piece of 1970s’ automotive history know as Recardo knew, that there is luxury and sophistication that only the Cordoba can provide.